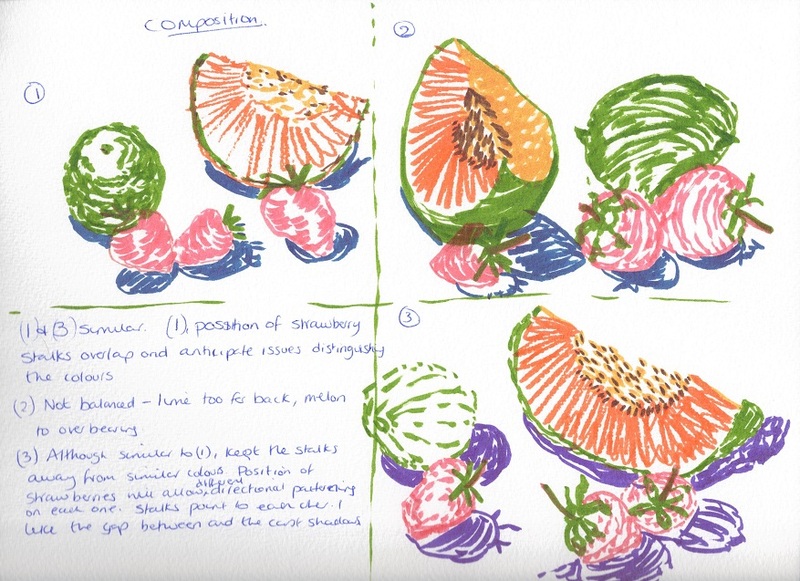 Work out at least three alternative compositions with your pieces of fruit and combination of colours in your sketchbook. Use a collection of markers with different sized ‑bre tips from ‑ne points to wedge shapes. Choose a variety of colours in different tonal values – some light, such as lemon yellow, and some with more intense colour, such as a deep warm yellow. Pick some vibrant coloured inks and have ready a couple of different widths of nibs for your dip pens. Try using both media together. 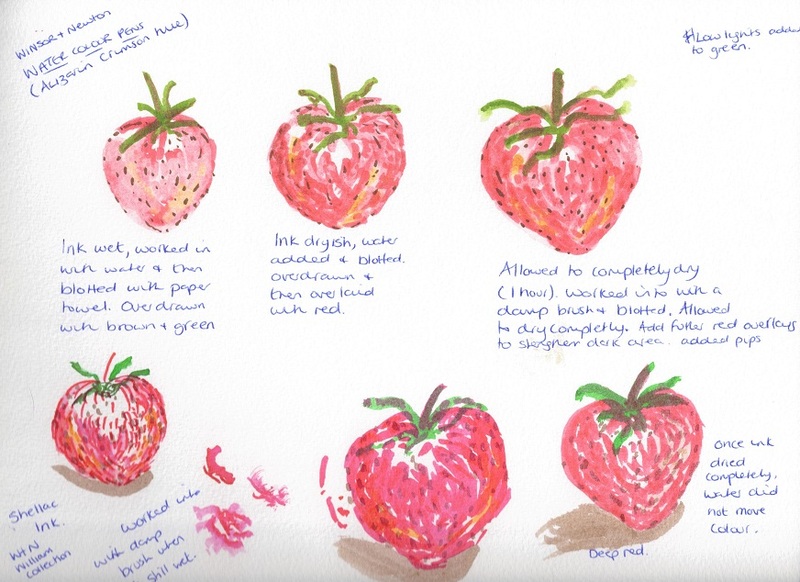 Use a sheet of paper with a rough surface such as watercolour paper. 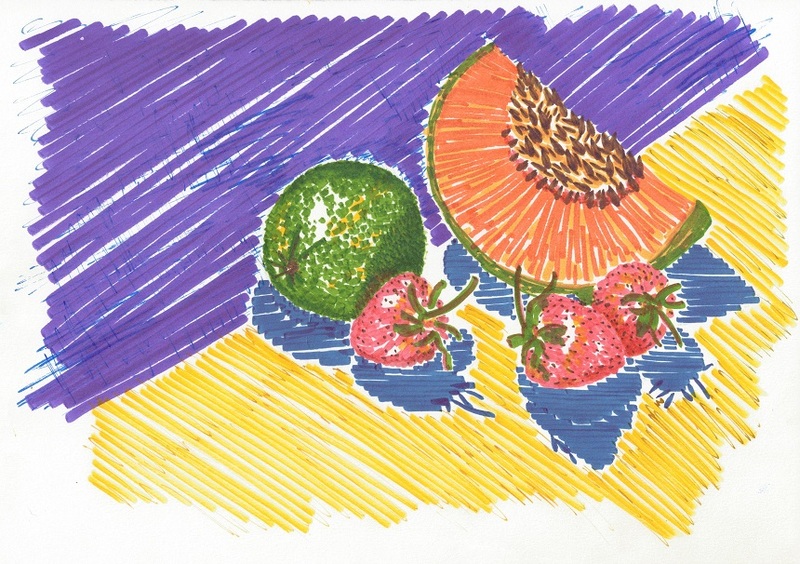 Then select the composition you feel is working best and draw it on an A4 sheet of cartridge paper. I decided to buy a set of 8 Winsor and Newton water colour markers as I didn’t feel confident about the markers from the pound shop. I have realised that buying cheap products is not cost effective and it’s best to research before buying media. One of my big mistakes was buying Derwent Academy coloured pencils, which in my opinion, were hopeless to use and after finding out what professional use, I decided to buy a selection of Faber Castel Polychromos. Also my local art shop recommended Derwent Colour soft, which were a more expensive pencil than the Polychromos After trying these two pencils, I preferred the Polychromos as the colour soft were very waxy. So it’s not what you pay either. There are so many different products at such a huge price range difference that it would be good if student stated what medium/brands/manufacturers they are using and their personal recommendations. 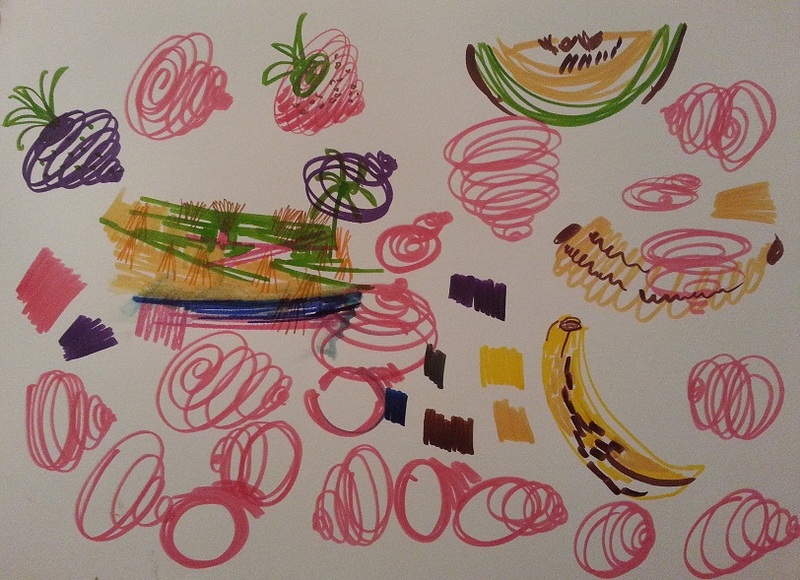 To start this exercise I thought I would see what sort of marks I could make, using the pens as a marker and also with water. 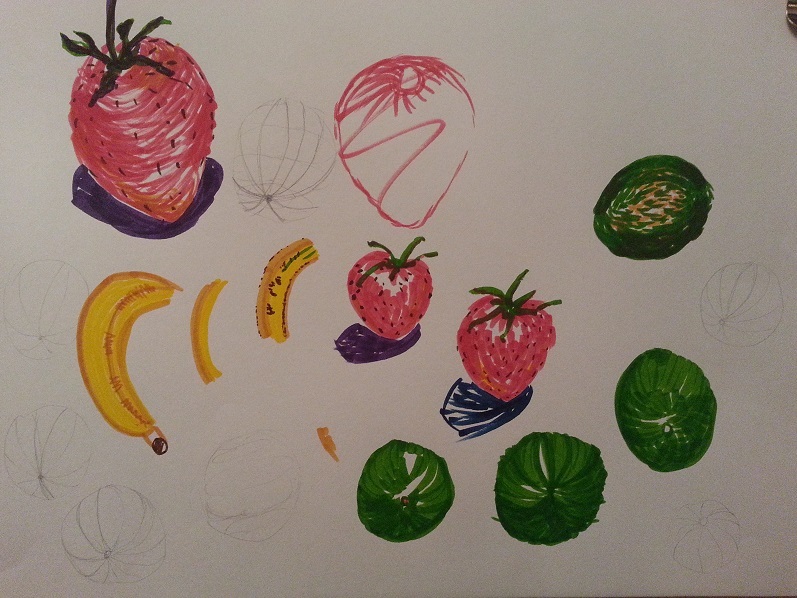 Because I had very limited colours I found that it was difficult to get representational colours of the objects. 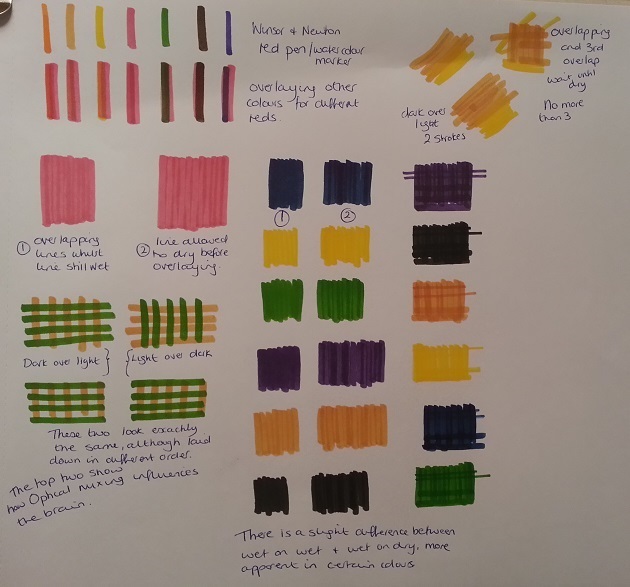 To overcome this, I further developed the ‘Exploring coloured media’ exercises using the 8 colours to see what was achievable. I was delighted to see the range of effects I created especially overlying the same colour several times. Some of the results could be used to suggest texture and build up tone. The first set of marks I did were on cartridge paper and I found the pigment sank straight into and dried almost instantaneously. I experimented with overlaying colours which gave some really lovely surprising results. First, because the marks dried very quickly, I attempted to work wet into wet which I just about managed which resulted in the overlapped lines being slightly diffused. The second set of lines were left to fully dry before being overlaid. This resulted in a more defined line. I used a selection of different colours to see the effects that darker colours made and also to see the transparency. 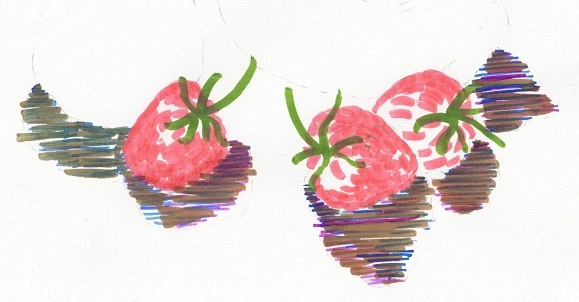 Using cartridge paper, I decided to experiment with different marks to find out how to draw the strawberry. I used different directions, length of marks and overlaying to achieve different tones and depths. To further experiment I decided to see how the pens reacted worked with water. Because the ink dried as soon as I laid down a mark, water didn’t change the mark very much as the mark was more or less permanent. Very little colour could be moved about with the water so I tried adding water a split second after laying down the mark, but again very little colour could be moved. This puzzled me as the pens are supposed to be water colour markers. 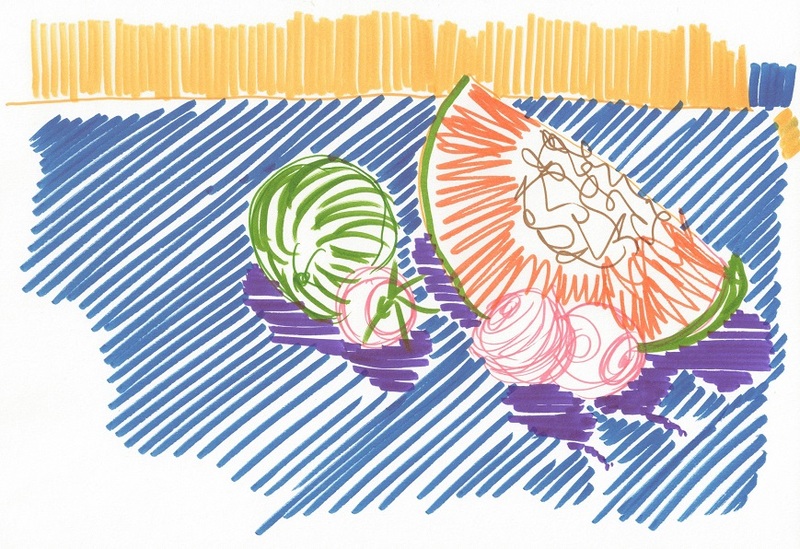 So I tried using water colour paper as the exercise suggested and the inks behaved completely differently. Drying times decreased significantly and there was plenty time to work into the mark with a damp wet brush. This was a light bulb moment for me in regard to papers, which I haven’t really explored yet. 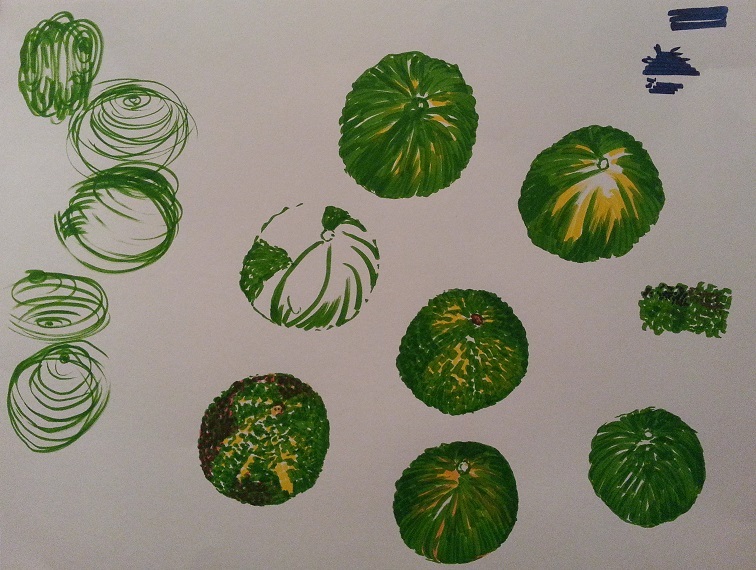 I used the same technique to work out how to draw the lime, making marks to suggest a 3D effect and tone. I made further marks, experimenting with shapes and lines to create tone and depth. 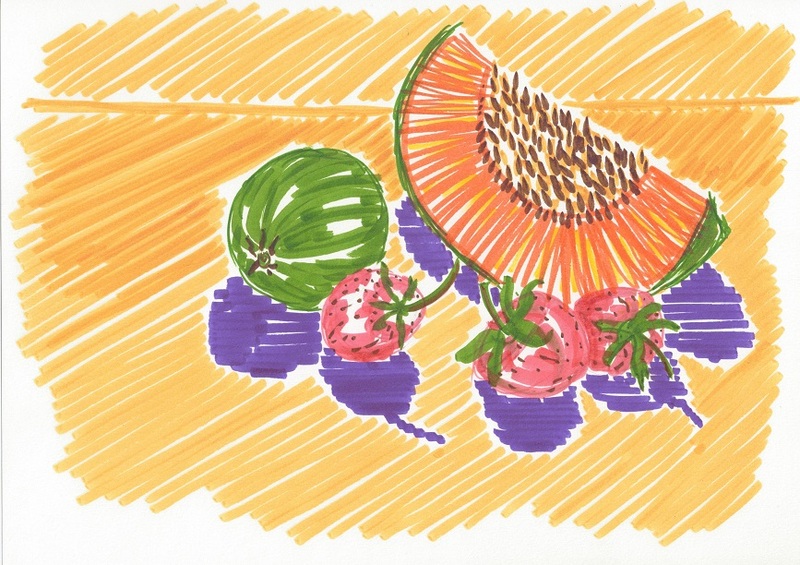 To draw the melon slice, I overlaid the same colour to achieve different tones and to attempt optical mixing. 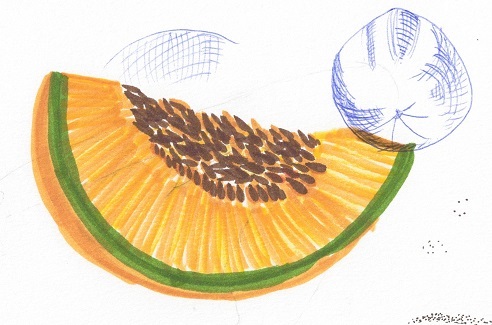 I used the tip of the brush end of the watercolour marker on its side to give gave a teardrop mark, for the seeds, which I quite like. Compositional studies, I chose the first one as I thought it was balanced as it took the eye in a circular motion around the drawing. A quick drawing to make sure I liked the composition.